We are very excited to announce that Schitt’s Creek is coming back for a sixth season on CBC and Pop in 2020! We also wanted to take this opportunity to let you know that we have decided season six will be our last. We are so grateful to have been given the time and creative freedom to tell this story in its totality, concluding with a final chapter that we had envisioned from the very beginning. Shooting for the next season will commence in the next couple weeks, with the final episodes airing in 2020. Those 14 episodes will feature, of course, Eugene and Daniel reprising their roles in the wealthy Rose family, with fellow cast members Catherine O’Hara, Annie Murphy, Chris Elliott, Emily Hampshire, Jennifer Robertson, Noah Reid, Dustin Milligan, Sarah Levy and Karen Robinson along for the victory lap. While we’re sad to see Schitt’s Creek—home of one of TV’s most relatable romances and an increasingly sweet family portrait—go, we’re glad that this isn’t being resurrected and dragged out a la Arrested Development. Roses – 1, Bluths – 0. 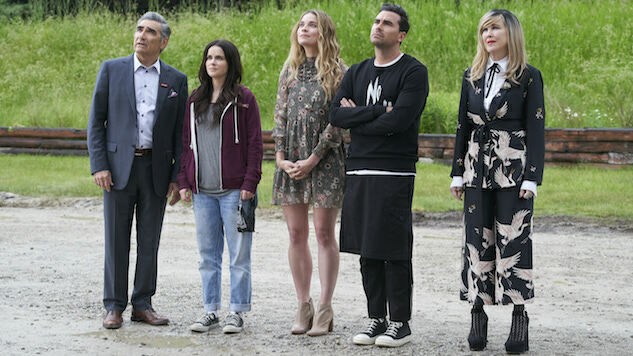 Watch season five of Schitt’s Creek, airing on Pop TV, Wednesday nights at 10 p.m., ET/PT.